"We speak of a mother's love, but we forget her power." Just a few generations ago, the planet's 500 inhabitants huddled together in the light and warmth of the Forest's lantern trees, afraid to venture out into the cold darkness around them. Now, humanity has spread across Eden, and two kingdoms have emerged. Both are sustained by violence and dominated by men - and both claim to be the favored children of Gela, the woman who came to Eden long ago on a boat that could cross the stars, and became the mother of them all. When young Starlight Brooking meets a handsome and powerful man from across Worldpool, she believes he will offer an outlet for her ambition and energy. But she has no inkling that she will become a stand-in for Gela herself, and wear Gela's fabled ring on her own finger - or that in this role, powerful and powerless all at once, she will try to change the course of Eden's history. 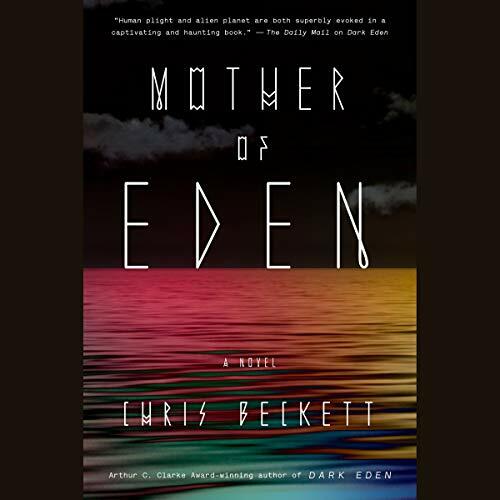 I'm actually surprised that Mother of Eden is my top pick of the year. It's a second book in a sci-fi trilogy that I was super excited to listen to - but I didn’t count on it haunting me all year long. Where Chris Beckett's first book intrigued with its tale of a small band of settlers in a strange world, the second book is grander in scope, and far more profound, tracking the next stage in the arc of civilization. For a relatively short work, this novel covers a lot of ground: it brilliantly captures gender role origins, linguistic development, empire building, and humanity’s innate tendency to seek out messianic experiences. It goes a long way towards untangling the question of how we got here as a society, and has led me towards works of nonfiction as well, fostering in me a new fascination with the history of human migration and colonialism. I've both read and listened to this book, and while the print version is a totally fascinating mind bender, the audio version takes it to the next level. Following on the brilliant production of the first book, a talented multicast worked to become studiously aligned on the unique linguistic system that Beckett provides. Hearing the bizarre accents and turns of phrase puts the listener on the ground of this warring new world. I can't recommend this series enough - and it's not just for lovers of sci-fi. If you enjoy allegorical literature or speculative fiction, this story will pull you in. This second book of Dark Eden increases in complexity and shows more of the dark side of human nature. Chris Beckett creates powerful metaphors and plants little verbal goodies along the way. The full cast was a nice compliment to the story. My only complaint is the ending which left me feeling unsatisfied. Is there another book on the horizon? I surely hope so. This audiobook is fantastic. The voice actors are much better in this book then the last and they really bring the book to life. The book takes place a few generations past when the last book left off and it is very interesting to see the progress of civilization in this book and the different ways on how they run things. I am happy to say that there is much less sexual talk in this book. I would recommend it to anyone who has read the first book or anyone who likes a story about power struggle. Simply outstanding--in scope and story and epic timeline! Outstanding, too, in creativity and description, world-building, as well as wonderful narration! A Must-Read series of novels! I've officially become a fan of this series! This book is a great continuation of the story of Eden. Fantastic visuals, fantastic subject matter! I've fallen in love with the characters of both books. This book hit on some heavy topics and really makes you think about our own past. Its interesting watching this world's culture, technology, and religion develop from ground zero. I'm excited excited to start the next book! Liked the book, especially enjoyed the world creates in the first as well, but this continuation of the storyline is good enough to make me want the third. I really liked this book. Not the best book ever but really enjoyable and a great audio book. probably better as a audio book then as a read. Dark Eden is intriguing and this book kept that intrigue alive. The imagination of some people amazes me. The book was performed very well. I can only imagine what it would be like to read this book. The accents were complex and each narrator did an amazing job.